Gerard Morris looks at colletables produced by the RNZAF. With 20 aircraft covering more than 7, 400 miles and the vast expanse of Australia and the Tasman Sea, the AOPA Australian Safari was a flying success. Alan Breen writes of the experiences this group of Kiwi Aviators had on their journey. 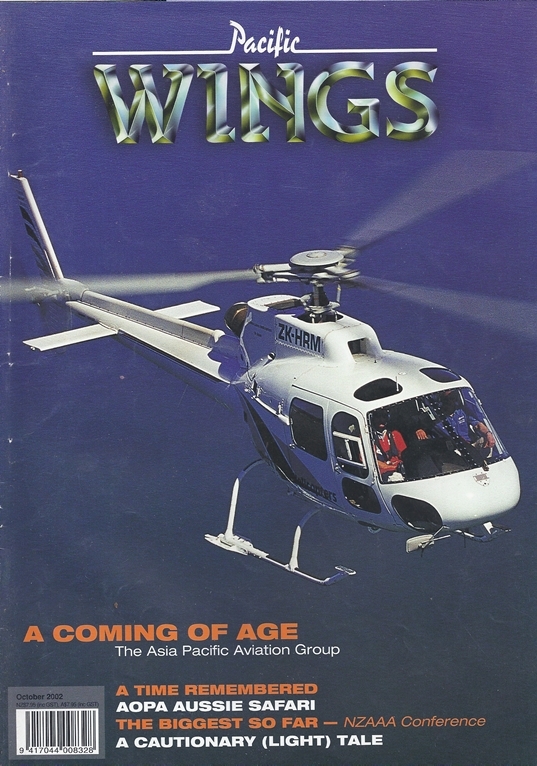 New Zealand's helicopter industry has survived its ""teenage years"" and a new breed of helicopter pilot has since been emerging - professional, smart, masterly. Rob Neil talks with the three men behind the Asia Pacific Aviation Group, one of the industry players stepping up to the plate. Ruth Presland describes an 40-year-old air accident that would affect every indivudal of a tight-knit Central Otago community. Another milestone, more Cresco's, cropdusterys and Flying Farmers Icon, by Ray Deerness. A watershed event in many ways, the ninth NZAAA conference attracted a large number of delegates with much to discuss. Ag correspondent Ray Deerness reports on the two days' proceedings from Hamilton. A low-key Farnborough International this time, but there were a few hightlights. Peter Cooper reports from his n ative airfield.